For much of this season the met men have struggled to predict what’s going to happen barely 12 hours in advance: those of us on the central south coast would have been better off ringing granny in Penzance (or Brightlingsea, depending on the wind direction) and asking her to look out of the window. As far as this Sunday was concerned, however, the forecasters seemed to be in no doubt several days ahead. It was going to be wet. And windy. And generally ‘orrible as far as any form of boating was concerned. And they were right. Unfortunately, Sunday was also the first day of Zhik Poole Week. 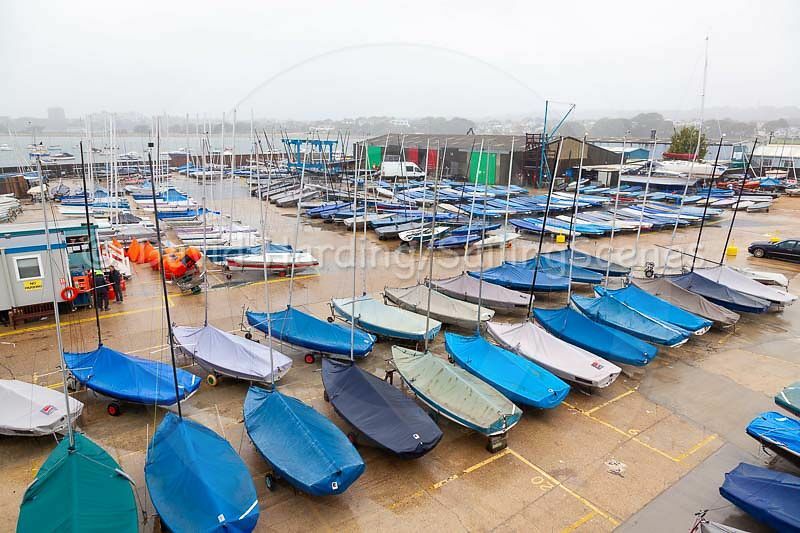 By the time the competitors had gathered at Parkstone Yacht Club for the briefing at 11am, the rain had already set in (slightly early – the met men weren’t that good). The wind, on the other hand, wasn’t frightening, even if rain always makes it feel at least 10 knots stronger than it really is. Parkstone’s starting platform was registering a manageable 17 knots gusting 23, but much more was promised. 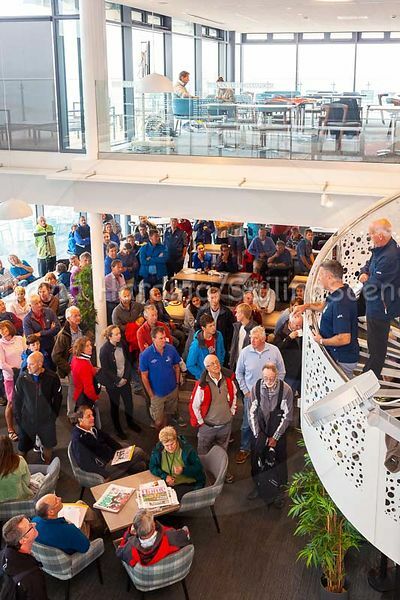 Principal Race Officer, Steve Tyler, announced that a decision would be made about the day’s racing at 12:00, by which time gusts over 30 had been recorded. 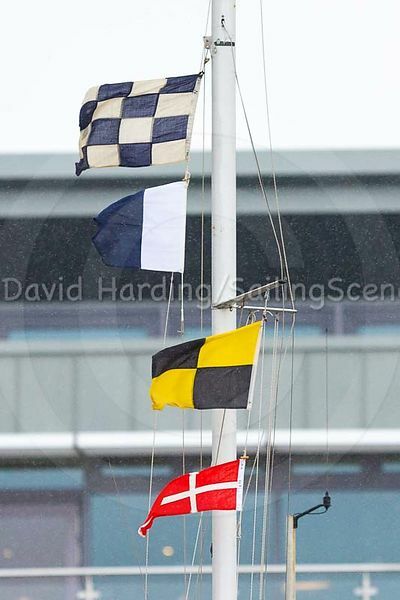 Flags N over A (no racing) were duly hoisted, much to the relief of those competitors who had already made the decision to stay ashore but were pleased not to see their chances of success during the week compromised. 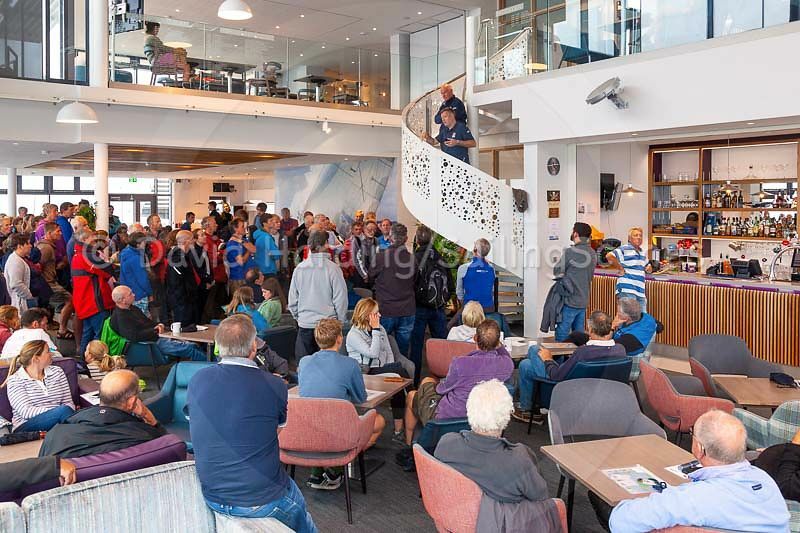 The loss of a day’s racing in Poole Week doesn’t mean there won’t be a prize-giving, however, because the random draw for the day’s Zhik goodie bag goes ahead regardless and any competitor can win. This brought everyone back to the club for the evening, many taking advantage of the food and drink vouchers included with their entry.